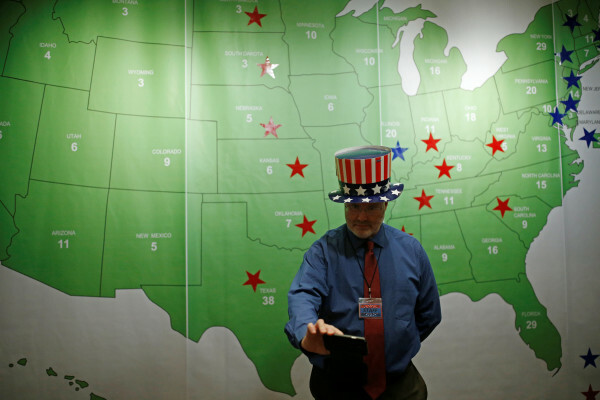 A man takes a selfie in front of the Electoral College map during a U.S. election watch event hosted by the U.S. Embassy on Nov. 9 at a hotel in Seoul, South Korea. Though Hillary Clinton defeated Trump in the national popular vote, Trump is now president-elect based on the indirect representational nature of the Electoral College. There is nothing particularly novel about this latest (un)democratic contradiction — it happened in 1876, 1888 and 2000 — except that it opens up a critical space for examining the racialized origin of the Electoral College. In the aftermath of any presidential election, statisticians aim to index the demographic features of the electorate. We have learned, for instance, that Clinton won 88 percent, 65 percent and 65 percent of the black, Latino and Asian vote, respectively, and that Trump captured 58 percent of the white vote. We also know that the white vote — especially unprecedented support from white women — put Trump over the top. While these isolated figures are certainly important for diagnosing electoral trends and predicting future turnout, they tend to prevent us from considering the historical roots of so-called colorblind instruments of U.S. democracy such as the Electoral College. To be clear, this critique of the racialized origin of the Electoral College should not be interpreted as the cheap product of disappointment over the election results, but rather as an effort to tap into what will likely be a short-lived public appetite for presidential politics in order to explore how U.S. political institutions are already racialized. To be sure, race and racism in the U.S. have long served as some of the most significant guarantors of democratic structures and institutions. In short, U.S. democracy is a racial project that hinges on policies of inclusion and exclusion. Perhaps unsurprisingly, the origin of the Electoral College, to paraphrase historian Ronald Takaki, is grounded in questions of racialized “insiderism” and “outsiderism.” To this end, the Electoral College is responsible for the fact that four of the first five presidents were white, slaveholding men from Virginia. The “Virginia” variable is key here, as it held the largest population of enslaved black men, women and children from the inception of the “peculiar institution” until the passage of the 13th Amendment. In 1787, white men of status met in Philadelphia to draft the Constitution. Questions of elections, taxation and governance, among others, were debated vigorously. One of the most contentious themes considered over the course of the four-month convention was by what process to elect a president. Two months into the meeting, Pennsylvania lawyer James Wilson proposed direct election of the president. Some delegates lamented that an “uneducated” populace would be incapable of the self-governance required for direct democracy. Such an elitist concern, however, was not what occupied the minds of most delegates, especially those from the South. James Madison — a slaveholder from Virginia — worried that such a system would compromise the political influence of the slaveholding South, a region of the country that based on its population of eligible voters would nearly always lose to the North in a direct election system. Virginia won big under the Electoral College system: the state occupied 12 of the 46 electoral votes (26 percent) needed to win an election in the first round. (As a reference point, such disproportionate overrepresentation would be tantamount to present-day California enjoying 70 electoral votes.) Whereas the Electoral College artificially enhanced the political influence of the South, it deflated the political influence of the North. After the 1800 census, for instance, Pennsylvania had 10 percent more free persons than Virginia but 20 percent fewer electoral votes. Simply stated, the Electoral College incentivized the institution of slavery; it was created to protect and propagate the enslavement of black people. The Electoral College brought to life the three-fifths compromise and helped to secure, extend and enhance the political power of the white slaveholding class whose epicenter at the end of the 18th century was Virginia. Christopher Petrella is a lecturer in American cultural studies at Bates College in Lewiston. His work is curated at christopherfrancispetrella.net. Follow him on Twitter at @CFPetrella. This piece was originally published on AAIHS.org.